The unholy alliance between the White House and ABC's George Stephanopoulos goes beyond mere conference calls with President Obama's Chief of Staff Rahm Emanuel. 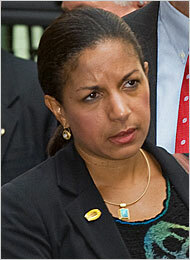 The executive producer of "This Week" is married to newly-confirmed United Nations Ambassador Susan Rice. You know those fawning little bios which the MSM runs? Well sometimes you learn the strangest things: “[UN Ambassador Susan] Rice is married to Canadian journalist Ian Cameron, executive producer of ABC’s This Week with George Stephanopoulos.” Wait. The EP of a top Sunday show is married to a top Obama official? Shouldn’t this be disclosed on air, at least when they are discussing foreign policy? It's official. Ian Cameron has been named executive producer of This Week With George Stephanopoulos, based in Washington. Cameron had been a senior producer at World News for the past seven years. What kind of objectivity can this program possibly have concerning the White House if its executive producer is married to a high-ranking member of the Administration?